The Maya Hieroglyph Dictionary provides translations and analyses of about 1,000 Maya hieroglyphic words and compounds, arranged in alphabetical order. Each entry will eventually include a picture of the hieroglyph as well as its transcription and a translation in English and Spanish. The Maya Hieroglyph Dictionary also provides analyses of the word or compound and cross-references to similar words and compounds. A major aim of the Maya Hieroglyph Dictionary is for it to be 'user-friendly', so that words can be looked up either by the Maya word or by their English or Spanish translation. This dictionary is an on-going project with continuous additions and corrections, therefore the ability to print the dictionary is split into two sections: Introductory Sections and the Dictionary Entries. Individual search results can be printed through a link on the results page. Click on the links below to view and print the dictionary. Click on a letter to acquire an alphabetical lists of words and syllables. Click on a letter to acquire an alphabetical lists of words. Use one of the fields below to search the dictionary. To view all entries leave fields blank and click the Search button. Wildcards can be used in any field except the date field. A wildcard (*) is used in place of the unknown. 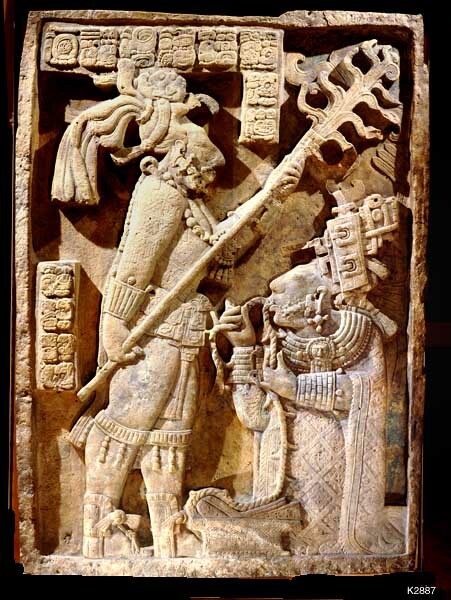 If you know the Maya word starts with 'chum' you can search for chum* to retrieve all words that begin with chum. Example search forms: chum*, *chum, *chum*. To search the 'Date Added' field, use the greater than, less than, or equal to (>,>=,<,<=) signs before the date you are searching for. Example: >= 06/15/2005. If no sign is used before the date, the default equal to (=) will be used.